*Los Angeles, CA – October 31, 2017- The NewCities Foundation and the Los Angeles Cleantech Incubator (LACI) today announced fifteen finalists from the L.A. New Mobility Challenge, a global startup competition focused on identifying the most innovative zero- emissions transportation technologies, smart infrastructure, and shared mobility solutions that will define the next era of sustainable urban transportation. 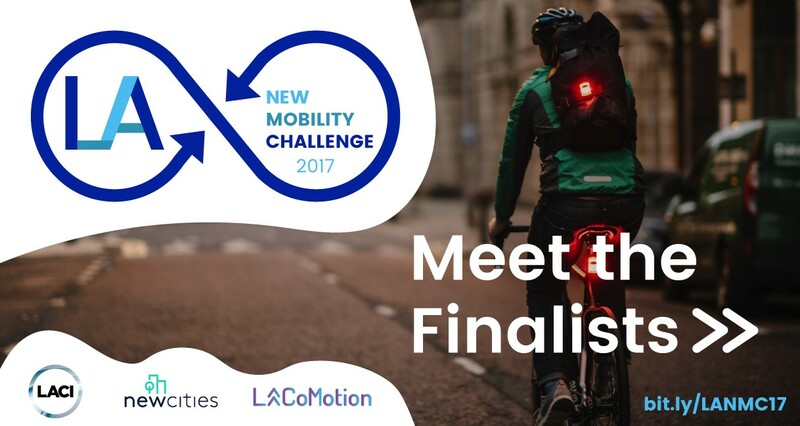 The fifteen urban mobility startups from the U.S., Canada, Spain, and the United Kingdom were narrowed down from more than 100 applicants from 15 countries. what3words is a global addressing system that has divided the world into 57 trillion 3m x 3m squares, each with a unique and fixed three-word address, providing a simple and human- friendly way to talk about precise locations. More universal and more accurate than street addressing, what3words has been built into navigation and transit systems, autonomous vehicles and drones. HAAS Alert is a mobility and smart city data service provider keeping emergency crews, drivers and the public safe through R2VTM (Responder-to-Vehicle) communication that alerts motorists when emergency responders are in the vicinity or en route to a call. Drivers and emergency crews use the real-time information to avoid collisions and reduce traffic delays, an important feature of a safer, more effective autonomous vehicle future. incubators in the world by UBI. In just five years, LACI has helped 65+ companies raise $135M in funding, create 1,500 jobs, and deliver more than $335M in long term economic value. LACI operates out of the La Kretz Innovation Campus in downtown LA with satellite offices in Northridge and the Silicon Valley, and is founder of the Network for Global Innovation NGIN. LACI recently acquired the Cleantech Open to amplify and expand their positive impact toward building an inclusive green global economy. For more information, please visit http://laci.org and follow us on Twitter and Facebook @LACIncubator. NewCities is an international nonprofit organization dedicated to making cities more inclusive, connected, healthy and vibrant. Focusing on people, places and policies, we bring together a global network of public and private sector leaders and Urban Tech innovators to foster results- oriented collaboration. We also produce actionable research that can be implemented by decision-makers across sectors.